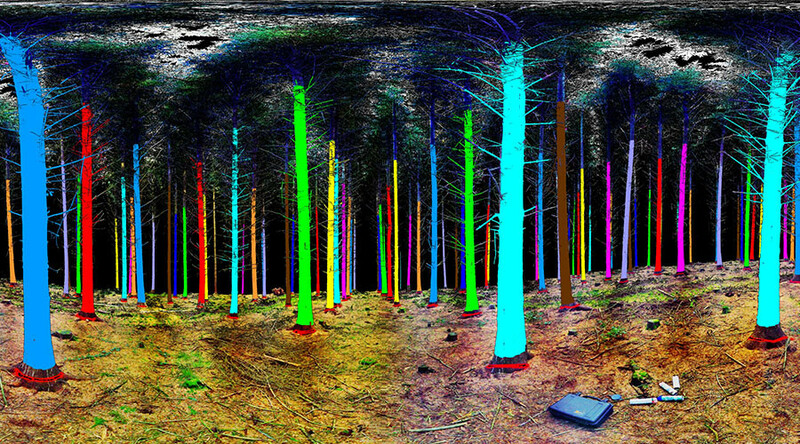 This otherworldly neon forest may look like a hiking trip bolstered with hallucinogens, but it’s actually how a new 3D laser scanning system sees a forest. Developed by an Irish firm in partnership with the European Space Agency, the project uses laser technology to tackle careless deforestation. Scanning forests allows loggers to establish how many trees are in front of them and how many they need to chop down, before any sawing starts. Treemetrics say they aim to maximize the use of trees and make the forestry industry much more sustainable. Using 3D thermal imaging and geotagging, the technology is able to pinpoint the best quality trees before they are felled. The system was created to save time, money, and the environment by cutting down only trees which are needed for fuel and construction. Typically, forestry workers might clear out whole areas of forests without first knowing what wood will be used. But this remote forest management software aims to bring “modern manufacturing” practices to the centuries-old industry. “We estimate 20 percent of global forest resources are currently going to waste as they are harvested,” Enda Keane, CEO of Treemetrics told RT. Treemetrics use the European Space Agency satellites and drones to map isolated forest regions so “we can spot if there is illegal logging happening,” added Keane. “What Treemetrics aims to deliver is more wood from fewer trees, through a complete end-to-end forest management system” which incorporates forest mapping, harvest planning, and real-time monitoring of tree cutting and collecting. “There’s a safety element there as well. Physically forests are a dangerous place to be working. If the machine driver is in trouble we can get communication out to the wider world,” Keane said. The Irish company is currently working with 26 state foresting agencies around the world, including in Russia, Australia, and South America.